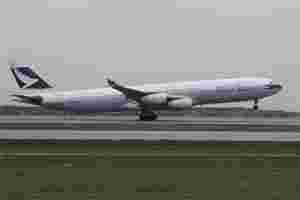 Paris: European plane maker Airbus said on Thursday it was abandoning production of its A340 long-haul four-engine aircraft, which failed to compete with Boeing’s 777. The abandoning of the programme will allow Airbus to write back into its books a provision of €192 million ($261 million) it had made on the programme. The A340 first flew in April 1992 and in 1993 it scored a record for the longest non-stop flight, between Paris and Auckland, New Zealand. The Boeing 777 launched two years later and had the same capacity but with only two engines it was more fuel-efficient. Airbus parent company EADS announced today a six-month delay in first deliveries of its A350 long-haul jetliner, designed to compete with Boeing’s 787 Dreamliner, but raised its outlook for the year after third-quarter profits surged.